When I wanted to store results from auditing websites, I used Pouchdb because of the reasons I mentioned in the earlier paragraph. 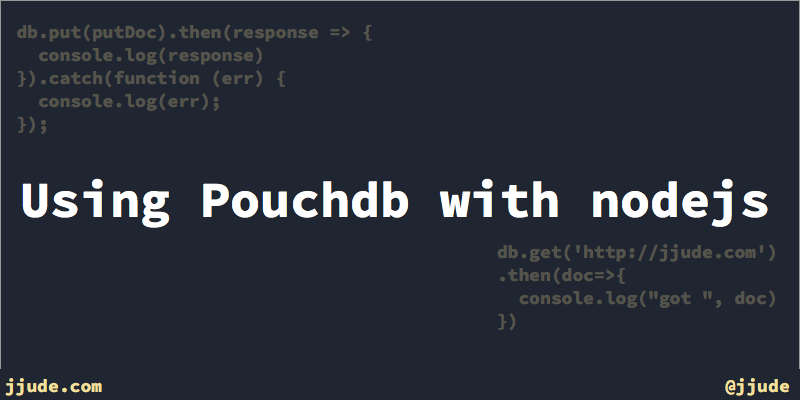 In this article, I explain how to use Pouchdb from nodejs. As with any nodejs package we start with installing. Let us install it with npm i pouchdb --save. Now it is available for us to use in our program. Pouchdb provides .post, .get, .put, and .delete methods to work with the db. Pouchdb inherently supports promises, so we will use the promises in this article. You can also use the regular callback methods. You can use either post or put to create a document. If you use post, an id is automatically created; if you use put, you need to supply the id. In some cases, you may want to supply the id explicitly. Since all querying operations are based on id, you should use put and supply the id. Pouchdb help document also recommends using put than post. If you use, put, and if you try to insert the same document, it will also throw an error. Another reason, why you should use put. This will return the earlier inserted document. You can use the same format to delete a document.